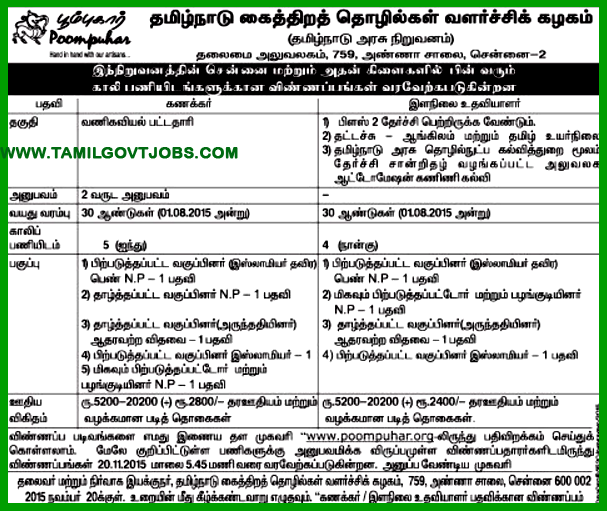 Tamilnadu Government Jobs Tamil Nadu Government Jobs: Poompuhar Tamilnadu Handicrafts Development Corporation Ltd, - Accountant & Junior Assistant Posts. Poompuhar Tamilnadu Handicrafts Development Corporation Ltd, - Accountant & Junior Assistant Posts. Accountant - 5 Posts - Basic Pay 5200 Grade Pay 2800 in Pay Band I category - Bachelor's Degree in Commerce (BCom) with 2 years experience - Age 30 years. Junior Assistant - 4 Posts - Basic Pay 5200 Grade Pay 2400 in Pay band I category - 12th Std Pass ; Typewriting Senior Grade in Tamil and English ; Office Automation Computer course certificate issued from Directorate of Technical Education Govt of Tamil Nadu or equivalent (ie DOEACC's 'O' Level certification) - Age 30 years. "Superscribe the envelope as ''Application for the post of ACCOUNTANT / JR ASSISTANT"